DVCPRO HD Digitizing Service in Los Angeles. Avid DNxHD | Uncompressed 8 or 10 bit. NTSC / PAL 1920X1080i pixel resolution. A hard drive for your digital files is needed. ProRes 422 HQ HD digital file size = 100GB per hour. Turnaround time usually 24-48 hours. DVCPRO HD, and all broadcast, industrial and consumer video formats. 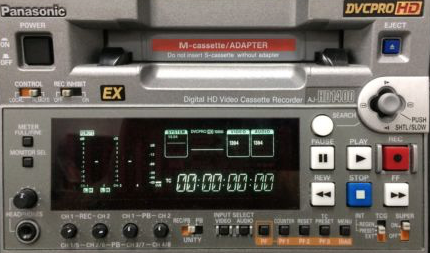 To learn more about our process of digitizing your DVCPRO HD tapes, please contact our friendly technical advisors who will answer all of your questions. or receive a quote by e-mail with the short form below.